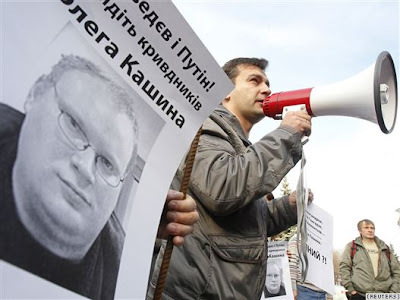 MOSCOW, Russia -- The recent spate of brutal beatings of journalists in Russia has confirmed the country’s seemingly inexorable slide in media-freedom rankings. Ukrainian protesters hold a portrait of Russian journalist Oleg Kashin during a protest. But as bad as things are in Moscow, Russia is just the epicenter of a vast post-Soviet afterglow which reaches out across the former communist bloc. One rule of thumb seems to be that things are at their worst the closer they are to the epicenter, both geographically and politically. Gravitating toward Moscow, Ukraine is a case in point. The Security Service of Ukraine (SBU) has been accused of intimidating and harassing journalists in the months since the election of President Viktor Yanukovych. Head of the SBU Valery Khoroshovsky was in Brussels this week and found time for a charm offensive during a brunch with some hand-picked journalists. But his comments only served to strengthen the suspicion that Kyiv now employs a different paradigm of the practice of journalism than that recognized by most Western countries (one could argue that Italy is increasingly becoming the exception to this rule). Let us call it the "Moscow Paradigm of Journalism." The key term in Khoroshovsky's presentation was "responsibility." Over the past five years (of largely Western-oriented leadership), Khoroshovsky said, Ukraine had "lost responsibility" -- the authorities, the public sphere, the media. Asked by RFE/RL to explain the concept of "responsibility" and its application to journalists, Khoroshovsky said "the responsibility of journalists is to be truthful." "Honesty," Khoroshovsky said, "is the top priority." And he added that all too often in Ukraine journalists are "contracted" to spread "disinformation." This preoccupation with the "truth" shows the "Moscow Paradigm of Journalism" at its best behaved (and least lethal). Forced to explain itself, it defines the media as an instrument, a conduit for information, a profession like any other with no claim to real political autonomy. This stands in stark opposition to how journalism is viewed in the West (in theory, if not always in practice) -- as an autonomous sub-domain of civil society, legitimately expected to comment on politics, criticize policy, act as a watchdog vis-a-vis political power, and enjoying a broad, legally enforceable immunity from the authorities. It all seems to boil down to the strength and/or "thickness" of civil society. In countries where civil society has not had the time or opportunity to develop, the powers-that-be automatically see all critics as opposition. Everything that is not expressly depoliticized to the satisfaction of whomever holds power, is seen as being in the domain of the political. And the object of all politics is to seize power (even Tony Blair offers this definition in his memoirs). Needless to say, the odds for civil society to put down roots in the former Soviet Union in the absence of intrusive EU (or U.S.) pressure are close to zero. This is becoming increasingly obvious in Georgia, where every television station and newspaper is either "government" or "opposition" (in fact, even hotels and restaurants are subject to the same categorization). Not to mention Belarus, Azerbaijan, and Armenia. And now it seems to be Ukraine's turn.